For the past few months, I’ve had a little problem that I’ve kept relatively secret. No matter what shampoo and conditioner I used, immediately after stepping out of the shower… my hair smelled. My hair smelled bad. Actually, I could smell the odor as soon as it got wet while I was in the shower. It was musty, and honestly had the essence of wet dog. That’s pleasant! I explored a few different explanations of where the hair odor may have been coming from. The first was the possibility of mildew. Because I have very thick and heavy hair, it takes hours for it to air dry which potentially fosters an environment for mildew. My hair definitely didn’t have the visual signs of mildew, but I still went about the recommended solution of using a clarifying shampoo and blow drying my hair religiously— no more air drying. After a few weeks of this, I saw (or smelled) no improvement. I moved on to a different potential cause. Maybe it was the hard water in my home? We have a water softener but I’ll admit that I don’t really know how it works. I add salt when it flashes low, and let it run on its own. As my next step, I made sure to top off the salt and had it “recharge” the water in my pipes. Next few showers: my hair felt softer, but the smell was still there. NEXT! Time to do a deeper dive on the internet. I literally googled “Why does my hair smell bad after I shower?” and was a little surprised at what I found. Something called “Smelly Hair Syndrome” was plastered across sites like Huffington Post and Daily Mail. I read several articles on the condition, which seemed to be a little more extreme than what I was experiencing, but not too far off. It’s related to oily scalp, and some articles mentioned fungal infections and seborrheic dermatitis. 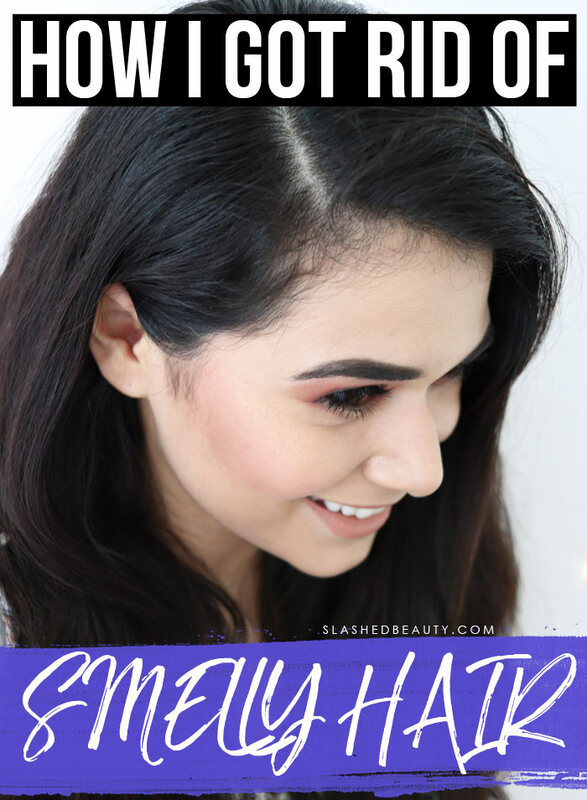 I looked further into seborrheic dermatitis because some of the other symptoms sounded like a fit for me: itchy scalp, dandruff, and redness. I’ve dealt with this my entire life but it’s definitely enhanced since moving to Vegas where it’s very dry. The condition is also listed as a possible cause of smelly hair due to increased oil production. T/Gel shampoo was brought up a few times, and I remembered I actually had a bottle of the shampoo and conditioner on hand! 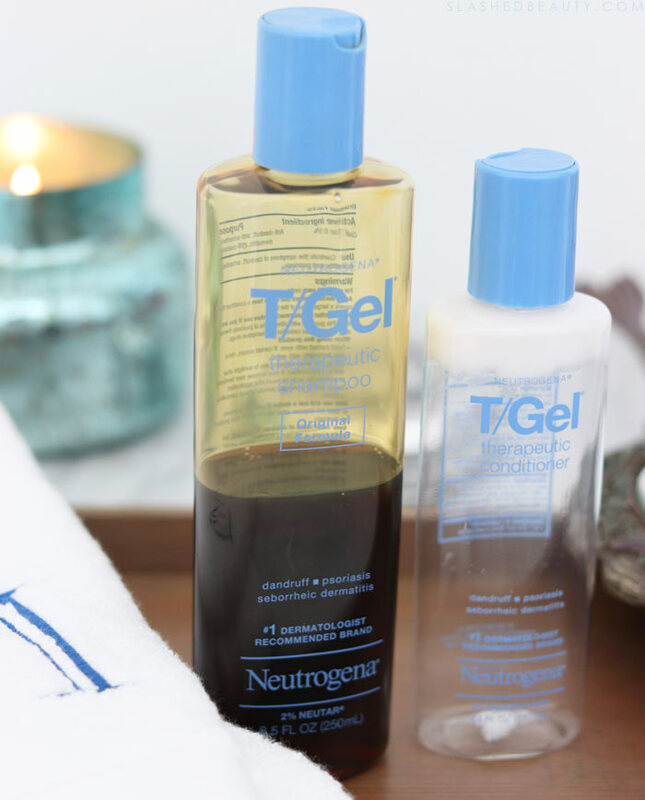 I used the Neutrogena T/Gel Shampoo, the active ingredient being Coal Tar, which is designed to treat dandruff, psoriasis, and seborrheic dermatitis. The smell of the shampoo is pretty medicinal and a little earthy, but a heck of a lot better than what my hair was smelling like. I applied it to my scalp in the shower, and also lathered it a little down the shafts of my hair. Following the directions, I let it sink in for a couple minutes before rinsing out. Then, I followed up with the T/Gel Conditioner, the active ingredient being Salicylic Acid which is known to help dandruff as well. This I focussed on the shafts and ends of my hair. Once I got out of the shower, I couldn’t smell anything but the shampoo. No mustiness, no wet dog smell. I even asked my husband, who had noticed the odor in the past, to take a sniff— and he couldn’t smell it anymore either! I used this shampoo & conditioner combo exclusively for about 3-5 washes, then started swapping out the conditioner with some of my hair masks but sticking with the shampoo. As of now, I’m not experiencing the issue anymore. Plus, my dandruff has been virtually non-existent. No flakes, no redness and no itchiness. 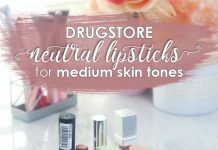 I’m blown away with how this affordable solution did such an amazing job almost immediately! I didn’t get an official diagnosis from a medical professional for this particular issue (though I have seen my doctor for my dandruff and gotten prescription shampoo). However, seeing how well this worked to solve basically all my scalp problems, I don’t have many doubts that this indeed was the issue all along. 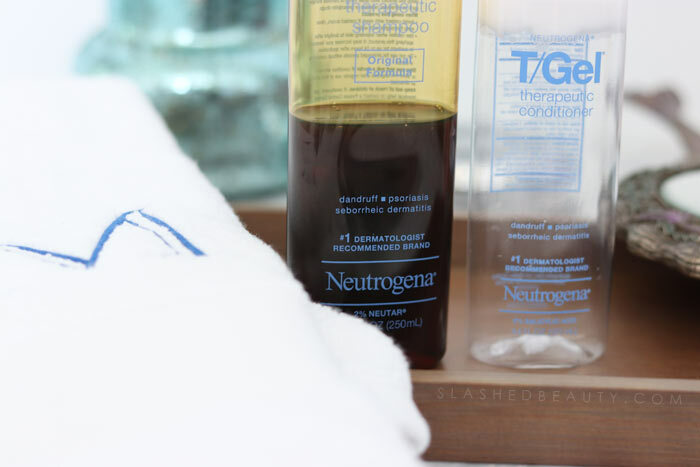 If you’re experiencing similar problems, whether it be smelly hair or stubborn dandruff, check out the Neutrogena T/Gel Shampoo— it’s over-the-counter and extremely affordable… and it works plain and simple. Have you ever experienced scalp issues? I’m dealing with this now , which is how I found you. The only difference is that my scalp itches and my hair (texture?) Is terrible! I’m going to try this and pray it works! Good luck, Joy! Please let me know if it works or if you find another remedy! This shampoo is AMAZING! I didn’t know they had a conditioner as well. My daughter has extremely thick hair and her scalp can get so dry that it peels in patches. This shampoo helps keep her scalp healthy and hydrated.